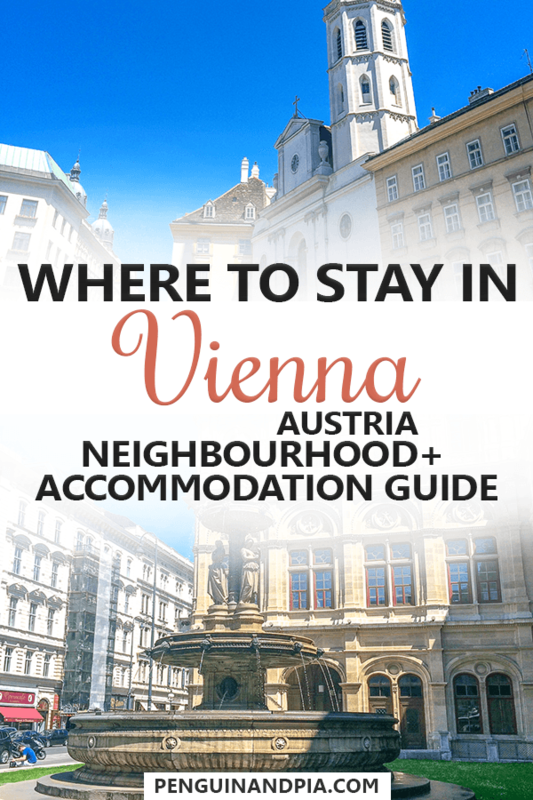 Deciding on Where to Stay in Vienna Doesn’t Have To Be Difficult! 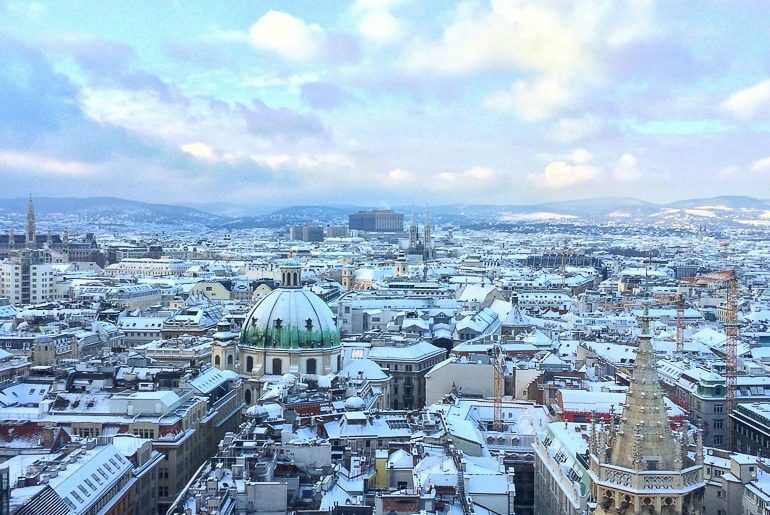 Looking for the best area to stay in Vienna? 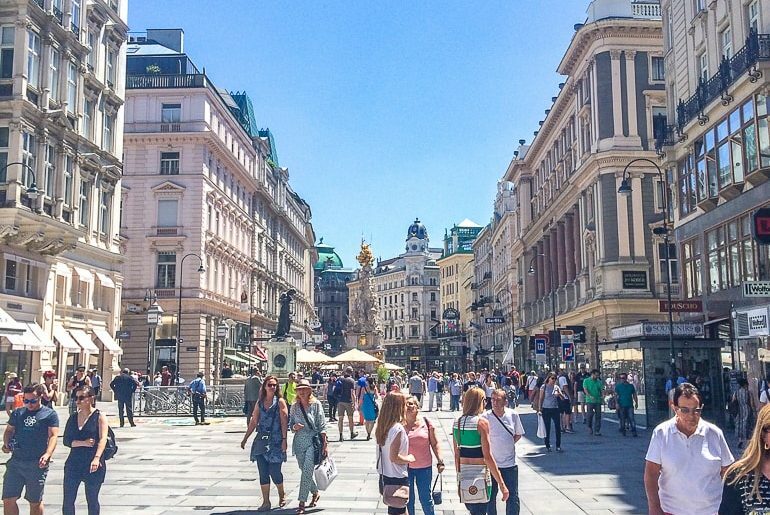 There’s more to consider than just the Vienna city centre! If you’re travelling to Vienna for the first time, finding a place to stay in Vienna is no easy task. There are plenty of accommodation styles around the city in very different districts/neighbourhoods. That said, there’s always new places to discover in the Austrian capital! We absolutely love Vienna. We’ve been to Vienna twice – once together and Eric went once while on a classic Europe trip. Being a couple that’s half German, it’s great we can experience the city in its native language. There is plenty to see and do in Vienna – and we could even see ourselves moving there one day! Of course, English is widely used since the city is popular and very diverse. 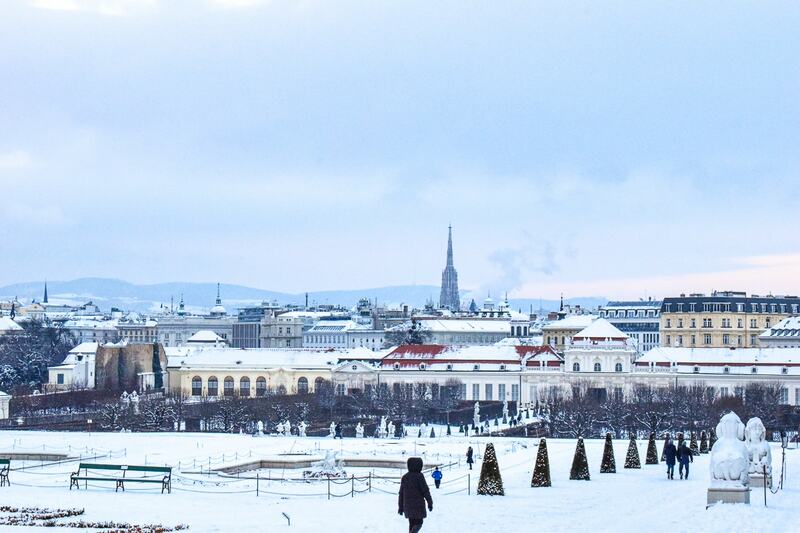 We like Vienna so much that it made our list of top winter destinations in Europe! 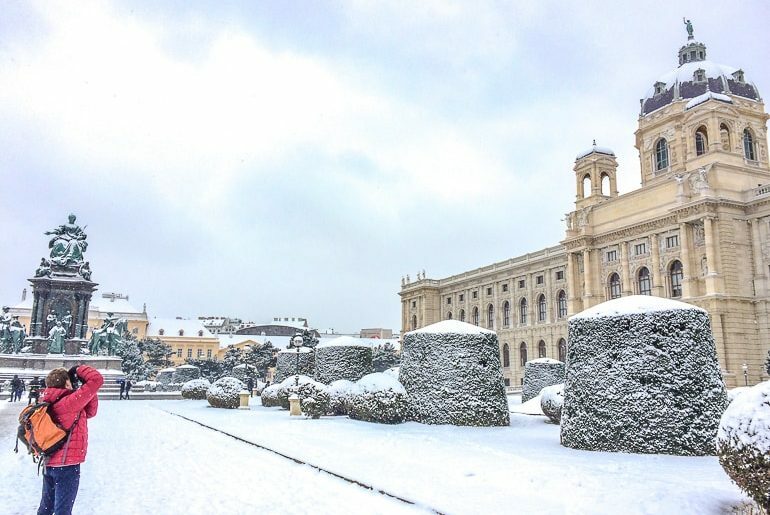 So, whether you travelling with family or looking for where to stay in Vienna for one or three nights, we have you covered! For this guide, we dive into the top districts (called Bezirke), tell you more about them, and then give suggestions for places to stay in each one. Below, we cover Vienna hotels and other accommodations by different styles – from apartments and hostels in Vienna to luxury and boutique Vienna hotels. Ready to get started? Let’s go! When you arrive in Vienna and get a change to have a walk around, you will notice a few things: like the city’s beauty, the amount of people, and how the neighborhoods change and have different vibes. It’s pretty neat. Most visitors stay in District 1 during their time in Vienna – and there’s just so much more to see! Speaking of districts, let’s explain that quickly because in this article, we will use districts/neighbourhoods almost interchangeably. In short, Vienna is divided into districts (called Bezirke in German). These districts all have a number and a name. The centre of the city, the Innere Stadt, is also District 1. From there, the numbers spiral out (kind of) up to 23! As a visitor to Vienna, many of the best attractions/food/tourist spots are in District 1 and the ones closest to the centre of the city. Because of this, Districts 1 through 9 are the areas where we would suggest you find a place to stay, as well. By staying in these districts you are “closer to the action” in lively neighbourhoods that are still walkable to basically everything else. That said, you COULD stay farther out than these districts. The outer districts (10 through 23) can be quieter with more green spaces and a more residential feel. Public transport in Vienna is quite good. However, we think that with limited time in Vienna your best bet would be to stay in a District numbered 1 through 9. You can still find a hotel deal in the centre UNLIKE in a city like Oslo where you just won’t (it’s very unlikely) find a true bargain in the city centre. As we mentioned, each numbered district has a name, too. You can see them below with a super, super brief description of what to expect. We will dive in and explain them in-depth further down! Generally, there aren’t too many areas that you should avoid in Vienna. That said, if you are a first time visitor then you might want to stay away from District 10: Favoriten. District 10, depending on who you talk to, can be a hotly contested area in the city. This is because of the high concentration of Vienna’s immigrant population. Over the years, people from all over Europe have settled here and brought their culture, food, and ideals. This makes the district wonderfully multicultural. It’s not necessarily unsafe or bad – it’s simply different from the others and, as a new traveller to Vienna, it may catch you by surprise if you end up there! To be honest, we heard there’s authentic food from the Balkan region – and we loved Bosnian cuisine… so we’d probably go and check out a few restaurants next time we are in Vienna! Since it’s a bit farther than the other districts to the centre, we have also left District 5: Margareten off this list as for where to stay in Vienna. However, you should consider checking it out if you are in the 4th or 6th District exploring the nearby Naschmarkt or at Vienna Central Station (Hauptbahnhof). Now that you know where the neighbourhoods/districts in Vienna are, we’re going to give a brief overview of those that you’ll most likely consider staying at. We will also suggest a few places to stay in each one. This way, you get a feel for what each one has to offer and can pick an accommodation in Vienna based on the location and budget that suits your needs! Walking in the heart of the Innere Stadt! It almost goes without saying that the centre of Vienna is a popular place to stay. Known as the Innere Stadt, this areas is like the heartbeat of the city. It is surrounded by the Ring Road – where the old town fortifications used to be. Innere Stadt includes many of the top attractions, shops, restaurants, opera houses, and hotels. Some of the top attractions we loved exploring are St. Stephen’s Cathedral, the Hofburg Palace, the Vienna Opera House, and the main pedestrian street Goldschmiedgasse. There’s SO much in District 1 – like amazing Wiener Schnitzel at Figlmüller. The centre is also very walkable – which is also one of the potential downsides to the area: it can get very busy during the day. Evenings are generally quieter though. If you’re interested in staying in District 1, you can check here for accommodations. Cheap Hotel Option: Alma Boutique Hotel – A boutique hotel with rooftop terrace close to the river. Mid-range Hotel Option: The Ring Hotel Vienna – An affordable luxury option with spa close to Opera House. Luxury Hotel Option: Hotel Sacher Vienna – A 5-star luxury hotel very close to the Opera House. Vienna’s District 2 is Leopoldstadt – and it’s huge. This sprawling district shares a border with District 1, 9, and 3 at the Donaukanal (a smaller waterway branching off the main Danube river) and expands northeast towards the Danube. With green spaces like Prater Park (and all the amusement that goes with it) and access to the Donauinsel, it’s no wonder this district feels like another city. There are also plenty of shops and cafes to keep you interested and there are loads of hotels in District 2 located just a quick walk across the bridge to the heart of District 1. If you think District 2 sounds right for you, you can check here for hotels in this area. Cheap Hotel Option: Hotel Stefanie – A well-known hotel right on other side of the river from District 1. Mid-range Hotel Option: Hotel City Central – An old charming hotel a quick walk to the centre across the Donaukanal. Luxury Hotel Option: SO/ Vienna – A super modern 5-star with amazing views of the Inner City from the lounge. Looking towards the Cathedral in District 1 through District 3 at Belvedere Palace. Touching District 1 and 4 in the centre of Vienna, District 3 – called Landstraße – actually has a lot going on! We’ve wandered District 3 quite a bit and found that we really liked the area. 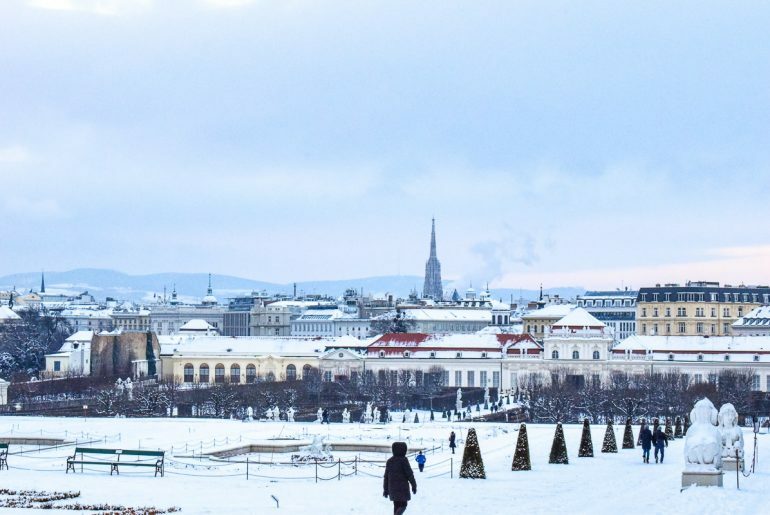 There’s plenty to see – like Belvedere Palace (both the gorgeous grounds and the buildings) as well as the Museum of Military History AND something called the “Hundertwasserhaus” which is that super colourful apartment complex/museum you see in Vienna photos all the time. Besides attractions, there’s shopping and food on Landstraßer Hauptstraße which runs right to Wien Mitte (a main station). This station is right beside Stadtpark – another green space that is connected to District 1! If you’d like to stay here, you can search for accommodation in Distinct 3. Cheap Hotel Option: Lindner Hotel am Belvedere – An affordable upscale hotel VERY close to Belvedere Palace grounds. Mid-range Hotel Option: Imperial Riding School Renaissance Vienna Hotel – A cool, trendy experience with a a gorgeous pool. Luxury Hotel Option: Vienna Marriott – A classic brand right on Stadtpark (It’s right on the border of District 1 and 3)! Karlskirche sits at the north end of District 4 – close to District 1! One of the smallest of the Districts, in Vienna, District 4 – also known as Wieden – is just south of the city centre. There are a few things to do and see here – like the famous Karlskirche (in the photo above) which is also close to the Opera House in District 1. Wieden also borders District 6 and shares the territory of the Naschmarkt – a famous open air market area selling basically any food item you might think of! Eric actually stayed in Wieden when he visited. The walk from Wombats City Hostel Naschmarkt to the city centre was lovely and not too far at all. Of course, there is also public transportation via metro. Generally, accommodations are cheaper here than in District 1. If Wieden is for you, check here for accommodation options in Wieden. Cheap Hotel Option: Austria Trend Hotel beim Theresianum – An affordable, simple, and clean hotel in the heart of District 4. Mid-range Hotel Option: Hotel Kaiserhof Vienna – An upscale hotel in a historic building. Luxury Hotel Option: Das Triest Hotel – A luxury design hotel beside the Karlskirche with Italian decor. 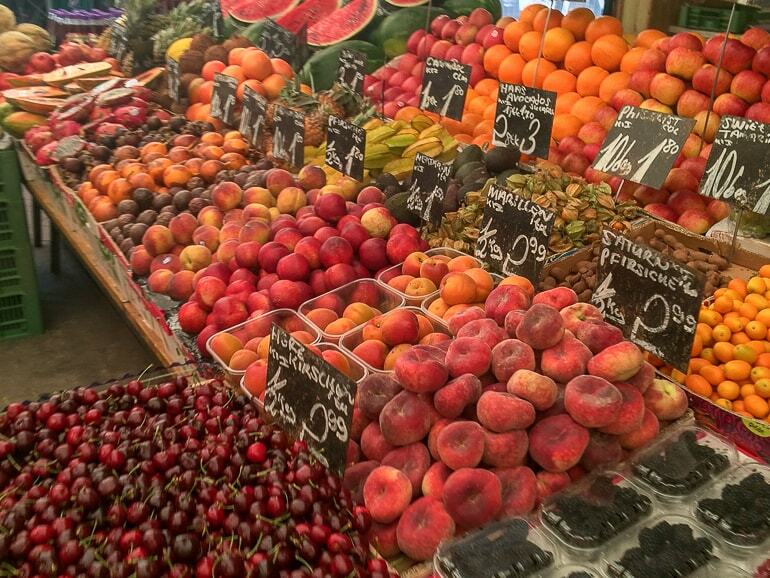 Stay close by to Naschmarkt and get your breakfast! Another smaller District, District 6, or Mariahilf, is snugged up between District 4 ,5 and 7 and touches 1 near the Opera House area. This district is known to be trendy with the high fashion street “Mariahilfer Strasse” the place to go shopping in the city. The district also borders the Naschmarkt (Vienna’s largest outdoor market)- hence the photo above. In Mariahilf, there are some restaurants, theatres and cafes to grab a coffee – but not as many as in District 7 (which we will get to). 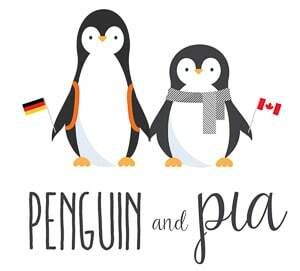 The area also has the Aquarium if you are travelling to Vienna with kids. If District 6 sounds right to you, check here for accommodations. Cheap Hotel Option: Leonardo Hotel Vienna – A fun 4-star in the heart of District 6 with nice breakfast. Mid-range Hotel Option: Hotel Das Tyrol – A bright and boutique hotel on the edge of District 6 and 7. Luxury Hotel Option: Hotel Beethoven – A modern and trendy hotel with comfy beds and a great name. Neubau is JUST BEHIND this area with all the the Museums. If you are looking to be one with the “cool kids”, then head for District 7! Jokes aside, Neubau has become the hipster district in recent years. This means that the area has a younger, cool vibe with plenty of cafes, restaurants, and patios for enjoying the Vienna life. The nice thing about Neubau is that it’s located right behind the Museums of Natural History and the Museum of Fine Art which means you are so close to the top attractions and a short walk to both District 1 and the Naschmarkt area. If Neubau speaks to you, check now for deals in District 7! Cheap Hotel Option: Pension Pharmador – A bright and clean hotel in a tranquil setting. Mid-range Hotel Option: Hotel Kugel – An elegant boutique hotel with easy access to the city centre. Luxury Hotel Option: Hotel Altstadt Vienna – A luxury property with trendy design and great breakfast. Squeezed between Districts 7 and 9 and connected to District 1 via the back of the massive Rathaus (Vienna town hall), District 8 – or Josefstadt – is similar to the trendiness of the 7th but to a lesser degree. It’s certainly more of a normal neighbourhood with nice cafes and hotels to stay at – but no main attractions like the other districts feature. In fact, you might walk from the 7th to the 8th and not even realize you crossed into it! It’s still well connected to the centre and has loads of places to stay because of how close it is to the Rathaus AND the Austrian Parliament Building. If you wan to stay in Josefstadt, check now for hotels here. Cheap Hotel Option: Hotel Graf Stadion – A cool and simple hotel behind the Rathaus. Mid-range Hotel Option: Hotel Josefshof am Rathaus – An bright 4-star hotel also right behind the Rathaus area. Luxury Hotel Option: The Levante Parliament Hotel – A luxury 5-star hotel with sauna and style. From the South Tower of St. Stephen’s Cathedral looking towards District 9. And last, but certainly not least, we come to Distirct 9. Alsergrund is aknown to be more of a student area because this is where you find the campus for the University of Vienna. This sprawling District connects to the 8th and the 1st since it sits northwest of the city centre. Besides bars and loads of places for food and drinks, there are a few attractions like the Sigmund Freud Museum and Votivkirche (a beautiful Gothic church). The District also hugs the Donaukanal so you get some water views as well. If you want to stay here in District 9, you can check now for hotels here. Cheap Hotel Option: Hotel & Palais Strudlhof – A clean and modern hotel with loads of space tucked away in District 9. Mid-range Hotel Option: Hotel Regina – A 4-star property conveniently on the border of District 9 and 1. Luxury Hotel Option: Hotel de France Vienna – A 5-star modern hotel also on the border of District 9 and 1. Exploring Eastern Europe Next? – Our Eastern Europe Itinerary is Waiting! Now that we have walked through a few of the main districts/neighborhoods in Vienna, we’re going to divide the post into Vienna accommodation by type. We’ll also offer up a few recommended places for you to look at! This way, if you know you want a certain style of accommodation, you can easily find and book what you are looking for. Apartments are a popular way to stay in Vienna (and in other European cities) if you want your own space, are staying longer than a few days, have a larger group, and/or want to cook your own meals to save a bit of money. These “self-catered” options are all over the city – with many affordable ones actually in District 1! If you want to stay in a lovely apartment to have your own space, you can find a great apartment in Vienna here. Located in District 2, these beautifully decorated apartments come in studios, one, and two bedroom flats. With a fully equipped kitchen and metro access to the city centre, think of them as a place to call home for a few days exploring Vienna. Located in District 1, this property is at the perfect location to stay right in the heart of the Innere Stadt. There are loads of restaurants and attractions nearby, but the apartment also comes with a full kitchen. Located in District 3 but very close to where it borders with District 1, the Mercure Grand Hotel is an authentic hotel experience tucked away in Vienna. Close to public transporation and with a sauna, this place might be for you! Hotel Kolping Wien Zentral is located in District 4 pretty close to the aquarium. Because District 4 (Wieden) is so small, you are also close to Naschmarkt. It’s a simple and cheap hotel that gets the job done as a place to stay in Vienna – works for us! Located in the centre of the heart of District one, you can’t get more central. With a great breakfast and boutique furnishings, Hotel Royal has everything – including a terrace eating area to look out over the centre of the city! It’s also surprisingly affordable for the location. Don’t let the name “motel” scare you – this is a high-class hotel. Located in District 1, this gorgeous chain hotel is beautifully decorated with a modern and elegant style. Also, the location near the Opera House is great if you plan on going! Located in District 1, this property absolutely also fits the “luxury” category but it’s so elegant and unique that we wanted it here in the boutique list. That said, this gorgeous boutique hotel is in an old elegant palace building. With exceptional service, terrace, and luxury, it’s definitely a place to write home about! Located right beside the Opera House in District 1, Hotel Bristol needs little introduction. Rooms and suites are decorated differently to suit different tastes, the place is full of character, and the staff will go the extra mile to make sure guests are well taken care of. Also located in District 1 close to the Opera House is Hotel Europa. This place is a 4-star property that’s clean and classy. The difference is that it’s a bit cheaper than the others listed here which is great for the location. There is a similar hotel just down the street by the same company – so check out the Trend Hotel Astoria for a bit of an upgrade. Also located in District 1 but closer to the Vienna Concert Hall (and also the Opera House), Hotel Imperial also needs little introduction. This historic 5-star hotel features just the utmost elegance from the moment you even look at the building. There’s also an excellent onsite restaurant and many other perks. Located in Wieden (District 4) basically right behind Karlskirche, Saint Shermin offers cozy yet trendy rooms with a really good breakfast. The staff are super attentive to guests’ needs – so have a look and see if it works for you! Located in the heart of District 9, this trendy art + design hotel offers guests a cozy B & B feel. It’s super clean, offers an excellent breakfast, and is well connected by public transit to get into the heart of the city. If you looking for hostels in Vienna, you will definitely have a few to choose from! Because it’s the capital city, this makes it a popular stop for all travellers from backpackers to couples. As such, there are lots of hostels all around the city for different styles and prices that are sure to suit your needs. As one of the most (if not the most) popular hostels in the city, Wombat’s Naschmarkt comes from a known chain in a great location. Eric really liked his stay here – in fact, it made our list of great European hostels we loved to stay in. From the clean dorm rooms to in-house bar and other perks like activities and friendly staff, Wombat’s is a no-brainer for a classic hostel experience in Vienna. Located just outside of District 6, this top-rated hostel is located between in a great area between the trendy districts, the market, and a doable walk into the centre. Full of tranquil green space compared to the hostel above, this place might be a good place for you to lay your head while exploring Vienna. 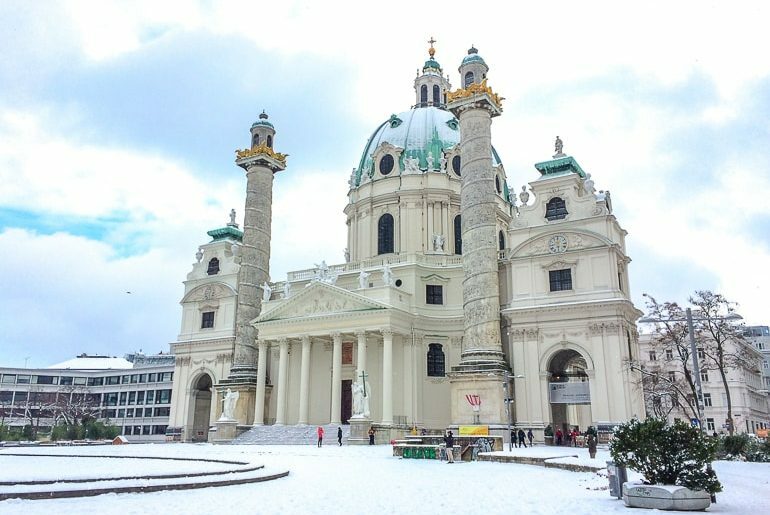 And there you have it – a detailed rundown of where to stay in Vienna as well as a few accommodation options by style! As we’ve mentioned before, Vienna can be a bit more expensive but you still can definitely find a place that fits your budget. We had a great time in the city and we hope to get back there to explore it some more very soon! What do you think? Where have you stayed in Vienna? Get in touch and let us know!